Usually, soft-bodied species like spiders aren't fossilized in rock like animals with bones and teeth. 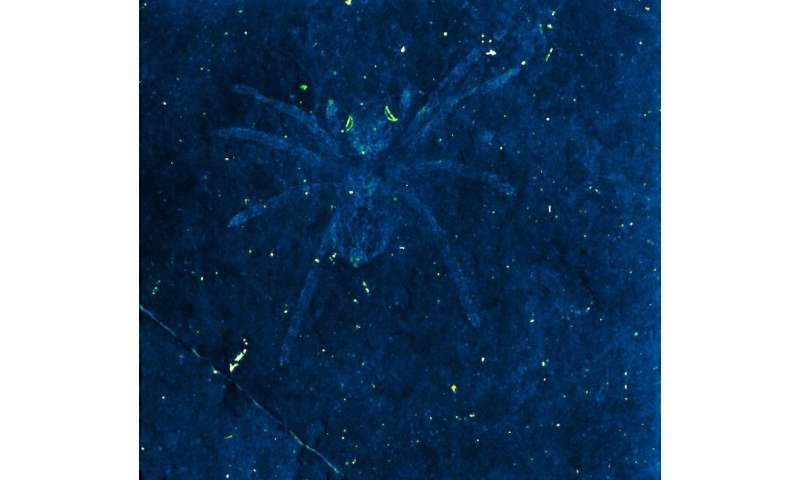 More often, ancient spiders and insects are more likely to be discovered preserved in amber. 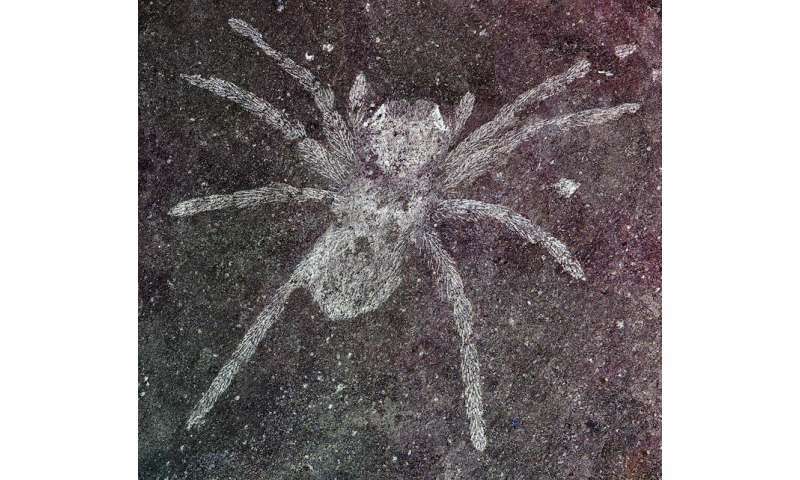 "Because these spiders were preserved in strange slivery flecks on dark rock, what was immediately obvious was their rather large eyes brightly marked with crescentic features," said Paul Selden, Gulf-Hedberg Distinguished Professor of Geology and director of the Paleontological Institute at KU's Biodiversity Institute and Natural History Museum. "I realized this must have been the tapetum—that's a reflective structure in an inverted eye where light comes in and is reverted back into retina cells. This is unlike a straightforward eye where light goes through and doesn't have a reflective characteristic." "ln spiders, the ones you see with really big eyes are jumping spiders, but their eyes are regular eyes—whereas wolf spiders at nighttime, you see their eyes reflected in light like cats," he said. "So, night-hunting predators tend to use this different kind of eye. This was the first time a tapetum had been in found in fossil. This tapetum was canoe-shaped—it looks a bit like a Canadian canoe. That will help us place this group of spiders among other families." "This is so rare because they're very soft—they don't have hard shells so they very easily decay," Selden said. "It has to be a very special situation where they were washed into a body of water. Normally, they'd float. But here, they sunk, and that kept them away from decaying bacteria—it may have been a low-oxygen condition. These rocks also are covered in little crustaceans and fish, so there maybe was some catastrophic event like an algal bloom that trapped them in a mucus mat and sunk them—but that's conjecture. We don't really know what caused this, but something killed off a lot of animals around the lake at one time or on an annual basis." "It's all black shale, and in that area it's very hilly," Selden said. "South Korea doesn't have much flat land to build anything. So, they carve away the hillsides to make a flat area, and there are temporary excavations while they're cutting away and building a factory or whatever—that's where they found these fossils."